The Who will release multiple versions of their 1969 masterpiece, “Tommy”, on November 11, including a Deluxe Edition and Super Deluxe Box Set. In May 1969, The Who were at a career crossroads. They were known mainly as a singles band, but the release of "Tommy" launched them as a serious ‘albums band’ and has now sold over 20 million copies while regularly turning up on lists of the most influential albums of all time. Coming after “The Who Sell Out” in 1967, it marked a complete change in style with Pete Townshend's lengthy conceptual narrative bringing exciting new opportunities to rock music. “Tommy” was and remains an ambitious, complex and controversial work, which was initially banned by the BBC. These new Deluxe and Super Deluxe versions of the album come with a wealth of previously unheard material in the form of 20 demos from Townshend’s archive and also a full live performance of “Tommy” from 1969 taken from tapes that infamously Townshend asked the band’s sound engineer to burn! Eighteen of the previously unheard and thought to be long lost live tracks are taken from a live show at the Capital Theatre in Ottawa, Ontario, on October 15th, 1969. Three others, “I’m Free”, “Tommy’s Holiday Camp” and “We’re Not Gonna Take It” were lost due to tape reels being changed during the show so are taken from later shows of the same era. As discussed at length in Townshend’s autobiography, “Who I Am”, the tapes were all supposed to be destroyed, but were kept by long time Who sound man Bob Pridden, despite Pete’s instructions. The Super Deluxe box also features a 5.1 mix featuring the complete album remixed in Surround Sound on new Hi Fidelity Pure Audio Blu-ray format. 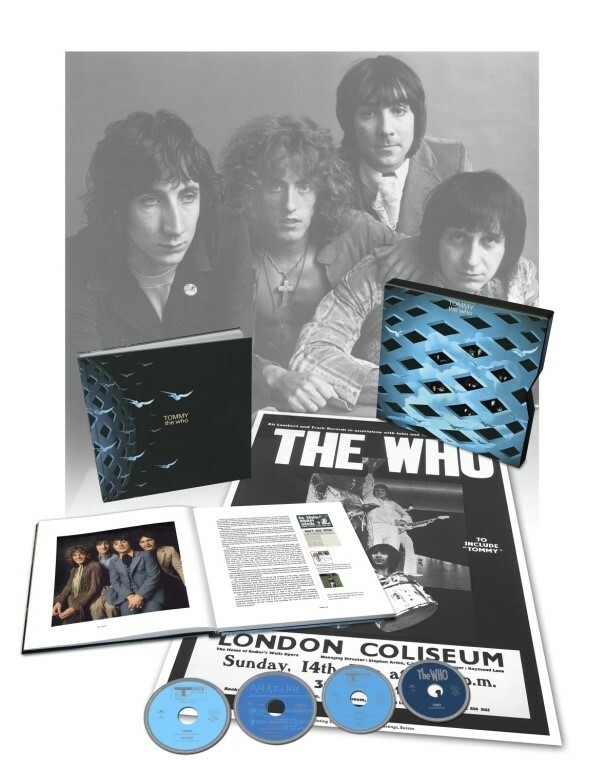 As well as the music, the limited edition Super Deluxe box set comes with a hardback 80-page, full-colour book featuring rare period photos, memorabilia, a 20,000-word essay by legendary Who aficionado Richard Barnes, and a rare facsimile Tommy poster housed in a hard-back deluxe slip-case. - Disc 1 - The original album (2013 remaster). Digitally remastered in HD. - Disc 2 - The demos and out-takes. Features 20 previously unreleased tracks from Pete Townshend’s demo archive. - Disc 3 - The 5.1 album mix - Hi Fidelity Pure Audio Blu-ray. The complete album remixed in surround sound on new Hi Fidelity Pure Audio Blu-ray format. - Disc 4 - The live ‘bootleg’ album. Features 21 previously-unreleased tracks from various live shows from 1969. - Hardback 80-page full-colour book featuring rare period photos and memorabilia. - 20,000-word essay by legendary Who aficionado Richard Barnes. - Rare facsimile Tommy poster. - Limited edition, housed in a hard-back deluxe slip-case . Track 24 - The Who - studio demo/out-take. Track 25 - The Who - studio recording (Note: This version was previously only available on The House That Track Built vinyl sampler).